How can Chiropractic care help my pain? Have you ever heard someone say, “It’s my typical headache or my occasional low back pain?” It is not normal to be in constant pain. Experts estimate that as many as 80% of the population will experience a back problem at some time in their lives. Low back pain is the single leading cause of disability worldwide, according to the Global Burden of Disease 2010. It is also the second most common reason for visits to the doctor’s office. One-half of all working Americans admit to having back pain symptoms each year and it is one of the most common reasons for missed work. The back is a complicated structure made up of bones, joints, ligaments and muscles. You can sprain ligaments, strain muscles, rupture disks, and irritate joints; all of which can lead to back pain. While sports injuries or accidents are the primary cause of back pain, sometimes the simplest of movements, such as bending over to pick up a sock from the floor, can have painful results. Most low back injuries are not the result of a single event, but are caused by cumulative trauma from repetitive loads. This is similar to bending a paper clip over and over again until it finally breaks. In addition, arthritis, poor posture, obesity, and psychological stress can cause or complicate back pain. 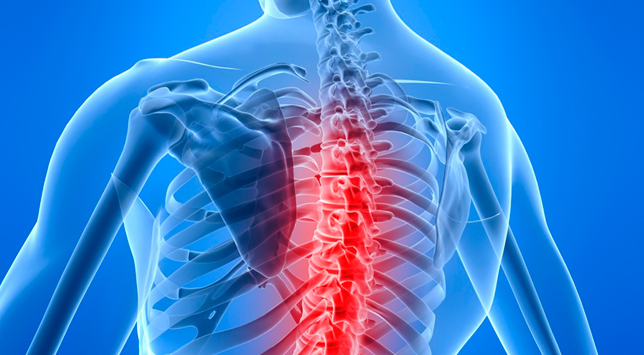 Most cases of back pain are mechanical or non-organic; meaning they are not caused by serious conditions such as inflammatory arthritis, infection, fracture or cancer. Pain is typically caused by irritation to nerves, not by pressure to those nerves. Pain is perceived in the brain when special nerve endings called “nociceptors” are stimulated. These pain receptors can be stimulated by either mechanical (movement) or chemical irritation (inflammation). These include, but are not limited to, accidents, bad posture, sports, sedentary lifestyle, depressive states and poor nutrition. So how does chiropractic care reduce pain? There are two main signals entering our brain from the outside world “sensation”: Pain (nociception) and Movement (proprioception). I often explain to patient’s that it’s like a teeter-totter; if one signal is lacking the other will override. When joints lose movement/proprioception, this decreases input to the brain and increases the experience for pain/nociceptors. You may understand this phenomenon if you have ever hit your “funny bone” or fallen on your knee, the first thing we usually do is to move or rub the area. By stimulating movement (proprioception) at the injury site, pain (nociception) is overridden in the brain. The chiropractic adjustment restores normal motion to the spine and other joints of the body, relaxes tight muscles, improves coordination and inhibits pain. So how do joints lose motion? Joints lose motion for several reasons: tight muscles, weak muscles, incorrect lifting , twisting, sneezing, accidents, sports injuries, bad posture and stationary positions. The process of restoring proper motion begins with chiropractic adjustments. Progressive healing continues when the patient adopts a process of proper living habits. Teaching patients what they can do for themselves is an essential part of caring for the person with pain. Tips to Prevent Back Pain: 1.Maintain a healthy diet and weight 2. Remain active 3. Avoid prolonged inactivity or bed rest. Bed rest can lead to a loss of muscle strength of 10% per week. In fact, most research indicates that: 1. Bed rest has no positive effect for lower back pain 2. It may have slightly harmful effects. When bed rest is recommended for pain, it should be clear that brief bed rest is suggested for temporary relief of the pain, but not as a treatment for the pain. 4. Warm up or stretch before exercising or other physical activities 5. Maintain proper posture 6. Wear comfortable, low-heeled shoes 7. Sleep on a mattress of medium firmness to minimize any curve in your spine. 8. Avoid bending over at the waist to pick things up, keep the object close to your body and do not twist when lifting. 9. Quit smoking. Smoking impairs blood flow; resulting in oxygen and nutrient deprivation to spinal tissues. 10. Try to ensure that your computer workstation is ergonomically correct. 11. Avoid lifting early in the morning or after prolonged sitting or flexion activities. We are most prone to injure the disc during the first hour out of bed 12. Avoid sit-ups : both straight-leg and bent leg. These activities are characterized by higher low-back compressive loads are harmful to the low back. Instead, perform side-bridge/ plank exercises, which activate more muscles.